Two words have entered the lexicon of eCommerce, and both are viewed rather negatively: “showrooming” and “webrooming”. Have you ever looked at a product in a shop, asked for a demonstration from the knowledgeable staff member, who has weighed up its pros and cons against other products … then gone home and ordered the item online? Congratulations. You’re a showroomer. From the customer’s perspective it makes sense. You get a proper hands-on demo, but then you get to find the best deal, which is a doddle online. But from the retailer’s perspective, it’s a lose-lose. They’ve paid for that stock and the premises and the helpful member of staff – but have seen zero return from their investment. And while showroomers might feel smug about their process, in the long-term it’s an unsustainable technique if they drive the brick-and-mortar retailers out of business. So you’re searching for a camera, reading online reviews, checking out the various deals the retailers have, and have come to a decision about which one you want. You put on your hat and coat and head off to the retail park, where you buy it from a shop you recognise. You just webroomed. But while the overheads for an ecommerce operation might not be as high as those of a physical retailer, there’s still a cost, especially if they’ve paid for ads to get you to their websites. The online retailers are effectively acting as sales staff for someone else’s benefit. 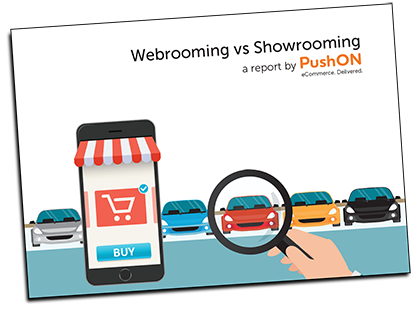 The two phenomena above have been studied by PushON in our special report, Webrooming v Showrooming, which uses data from our survey plus information gleaned from our own clients to shine a light on the two customer habits and how they are affecting retail. You can download the report here. By asking customers for their own takes on showrooming and webrooming, and drilling down to the factors that inspire their decisions, we have uncovered a much more complex picture than might previously have been imagined. We discovered that the price of the product plays a big part in people’s online/offline purchase choice. In general, the higher the price, the less likely they are to buy it online. Similarly, there’s a correlation between income and likelihood of shopping in-store. Richer folk like that personal touch, whereas those lower down the socioeconomic scale are more concerned with the price. Is your retail offering set up to satisfy those needs? The report looks at these effects and many more, including consumers’ views on technology such as augmented reality, which can blur the boundaries between a simple online experience and immersing oneself in a product. If there’s an overarching finding, however, it’s that as a retailer you probably need to be working harder to treat your online/offline retail channels as a single funnel if you’re to maintain the attention of those fickle customers. It’s not enough to accept your place in the arrangement and hope you pickup the odd passing webroomer or showroomer. You need to be able to convince those researching customers who are visiting your space that sticking with you for the entire transaction is the smart thing to do. Intelligent pricing, complementary deals, after-sales service, reputation and reviews can all be worked on to make the case that you’re the one. For years, marketers have been telling you to give as much information as possible for customers to do their research. But the days of being a passive provider of usable information while other retailers mop up the profits are over. You’ve worked hard enough simply to get a potential customer to walk into your shop or visit your website. Armed with the bigger picture, you should be better placed to convert them into paying customers.